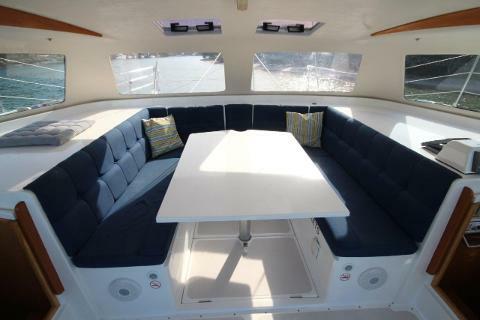 Our package includes exclusive use of the boat and skipper. Departing at 5pm, for a 2 hour cruise around beautiful Sydney Harbour, where you will anchor in a secluded bay, the skipper will then leave you alone to enjoy the evening. The skipper will return the following morning, after you have enjoyed breakfast,to bring you back. Our delicious menu starts with a grazing box, followed by a choice of two different main courses, and includes breakfast and coffee the following morning. A extra charge applies if there is more that two guests, max of 4 guests. 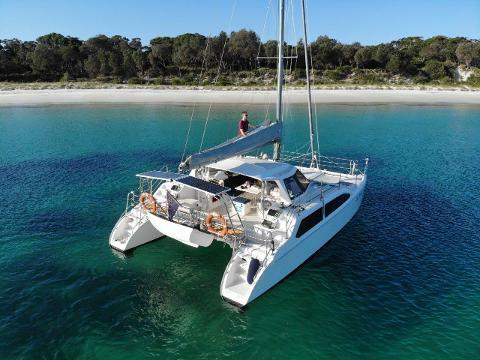 This Seawind 1000 catamaran is in superb condition, features a BBQ, quality upholstery and electric flushing toilet.